CELEBRATING 25 YEARS OF ART! Another year…another cascade of art from Theatre Gigante…and this one’s a big one, because it’s our 25th Year. Quite productive – with the creation and presentation of three new works, another Night at Paddy’s Pub, two children’s shows, and a tour in Slovenia – 2012 is a year to remember! “One of the best things to get staged all season” is how Russ Bickerstaff (Shepherd Express) described the new work, OURXOURXTOWN, created by Isabelle and Mark with their stellar cast, as an homage to their dear friend Ed Burgess, who died last year. 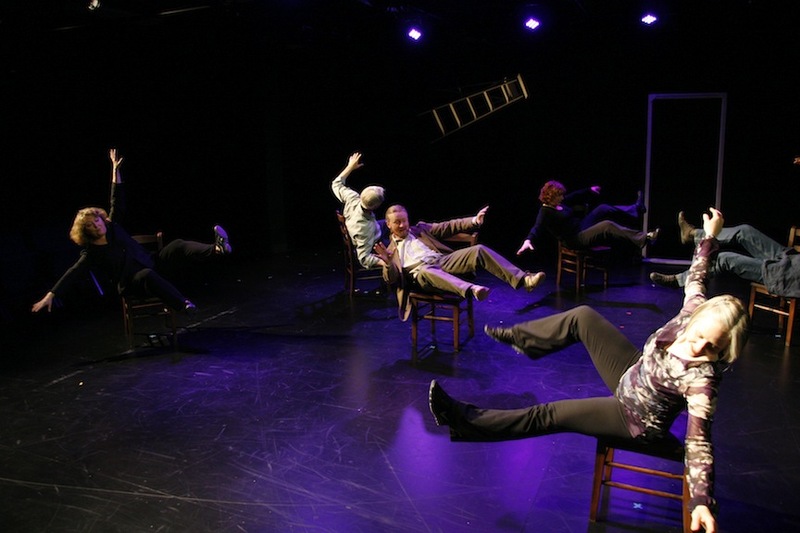 A pastiche of text, movement, and improvisation, performed by John Kishline, Deborah Clifton, Elizabeth Johnson, Iain Court, Isabelle and Mark, the show also featured scenery by Rick Graham, and lights by Nathan Booth. Working with this wonderful group, in the shadow of Ed, was one of the high points of the year. …material this good and delivered this well is bound to sustain, long after the lights come down and we walk back out into the night, no longer alone. …the willingness to discover or uncover something new, original and even beautiful. And that reminder is worth the 15-year wait. A third new work, NEITHER HERE… was created by Isabelle and Mark for Cynthia Thompson and was performed at James Madison University in Virginia. The piece, a tribute to immigrants and refugees, combined movement and text. On a program with other works, it was beautifully performed and well received. Besides the above-mentioned premieres, Gigante brought three existing shows to the community. In a night at Paddy’s Pub, nationally acclaimed performance artist Holly Hughes performed her hilarious THE DOG & PONY SHOW. Children were also entertained with PETER & the WOLF & the ONE MAN BAND, and FOUNDATIONS & ARCHITECTURE IN MUSIC & DANCE, both presented in schools through the Milwaukee Symphony Orchestra’s ACE Program. And the highest high point of the year…a five-city tour in Slovenia of Isabelle and Mark’s THREE OTHER SISTERS (originally premiered in Milwaukee in 2010). The piece was reassembled for the tour with the original team: Isabelle, Janet Lilly and Simone Ferro as the sisters; Slovenian singer/songwriter Vlado Kreslin as the man they fell for; Seth Warren-Crow on percussion; and our design staff, Rick Graham and Nathan Booth. Isabelle, Janet and Simone began rehearsing in July, then the cast and crew flew to Slovenia at the beginning of October where Vlado joined the Gigante team and put on a darn good show in Maribor, Ptuj, Murska Sobota, Koper and Ljubljana, the capital. The tour was sponsored the State Department and the US Embassy in Ljubljana, the Slovenian Ministry for Slovenians abroad, and various private funders, including UWM’s Slovenian Arts Program. US Ambassador Joseph Mussomeli attended the production, enjoyed it very much and proclaimed the project a wonderful success. Slovenian audiences seemed to agree as the performers enjoyed flowers on stage and lots of applause…counted 24-26 bows nightly. An audience member in Slovenia had this to say about THREE OTHER SISTERS: The performance was beautiful, beyond expectation. Beautifully spoken, with subtitles, which we did not need, the “sisters” spoke English beautifully, literally and clearly. All three acted and danced “super” (superbly). Of course, the musical portion by Vlado Kreslin was very, very lovely. We all enjoyed it enormously…I liked the story – simple, one conflict, yet it kept you tense through the end. True to life, realistic, not at all dull or dragged out. I liked the combination of dance, music, and acting. The night passed quickly. …one can see that they perform with their heart and soul, as though each performance was made especially for that particular evening’s audience. One can see that they play passionately. Culture (art) is not simplistic. It is a living thing, which ennobles one, if one knows how to give oneself to it. I wish them many more performances.